In his second and third years at Murray State head coach Ron Greene had led the Racers to their most successful back-to-back seasons in nearly a decade. And with eight players back everyone expected the 1981-82 season to be more of the same. Six of the returning players – Lamont Sleets, Glen Green, Brian Stewart, Kenney Hammonds, Walter Davis, and Tony Slaughter – had starting experience. And transfers Ricky Hood and Mike McDuffen were starters prior to enrolling at MSU. But after four games the Racers were struggling and Sleets was sidelined with a broken ankle, suffered in a loss to Southern Illinois. They were coming off of a loss at home to Arkansas College in which they missed missed the front end of seven 1-and-1 opportunities. The media was less than kind. 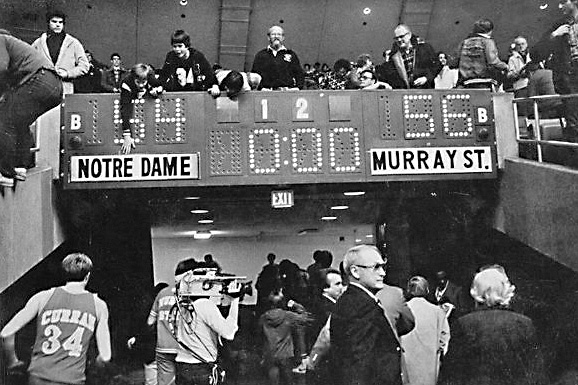 Murray State was 2-2 having just lost to an NAIA school, its best player had a broken ankle, players were grumbling about playing time, and a trip to South Bend to play the powerful Fighting Irish was up next. To say things looked bleak would be an understatement. And then, suddenly, things changed. Greene arranged for MSU's offensive end to be in front of the Racers' bench in the second half against Notre Dame. Never mind that this meant the Notre Dame student section was behind the basket they were shooting at. And the same players who couldn't make free throws against Arkansas College were rock solid at the line as Murray State upset the Irish 56-54. Glen Green led the way for MSU with 15 points and after being knocked to the floor he picked himself up and and blocked a shot by Notre Dame's Barry Spencer at the buzzer that would have sent the game into overtime. Bill Jauss wrote in the Chicago Tribune that, "Notre Dame had never before lost to anyone other than a national power in its 14 year old Athletic and Convocation Center.